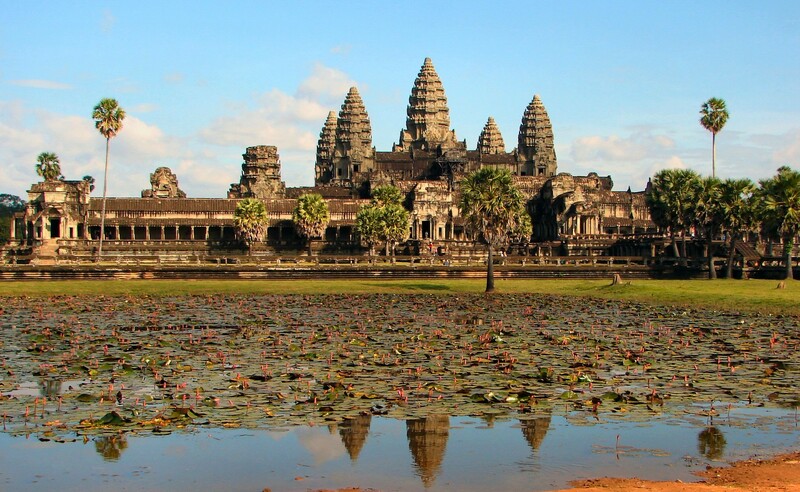 Every year, millions of visitors flock to Angkor Wat – an ancient temple in modern-day Cambodia and the heart of the one-time capitol of the Khmer Empire. There, they marvel at the 900-year-old towers, a giant moat and the shallow relief sculptures of Hindu gods, and the intricate architecture and carvings. However, until very recently, they were unaware of the paintings on the temple walls, representations of daily life that were hiding in plain sight. Built between A.D. 1113 and 1150, Angkor Wat stood at the center of Angkor, the capital of the Khmer Empire. The 500-acre (200 hectares) complex, one of the largest religious monuments ever erected, originally served as a Hindu temple dedicated to the god Vishnu, but was transformed into a Buddhist temple in the 14th century. 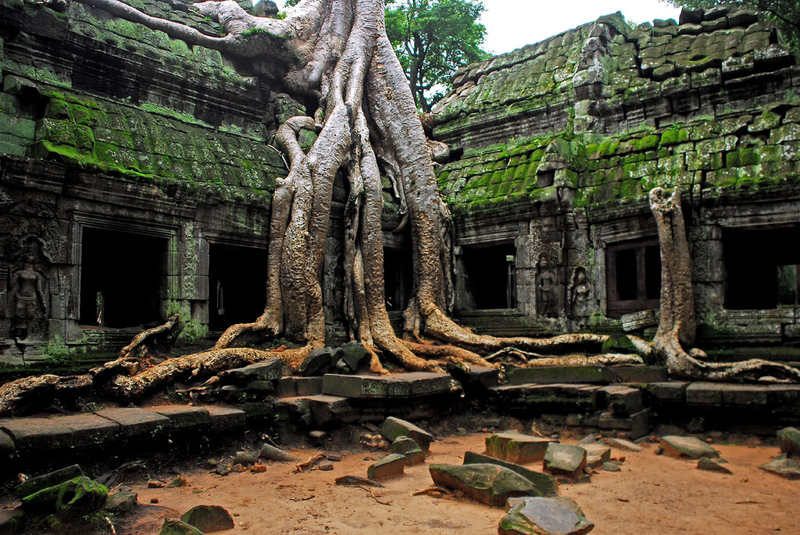 Since that time, the temple has become a symbol of national pride for Cambodia and the source of much archaeological and historical research and speculation. Thanks to digitally enhanced images, some tw0-hundred detailed murals have bee revealed that depict elephants, deities, boats, orchestral ensembles and people riding horses — all of which were invisible to the naked eye. 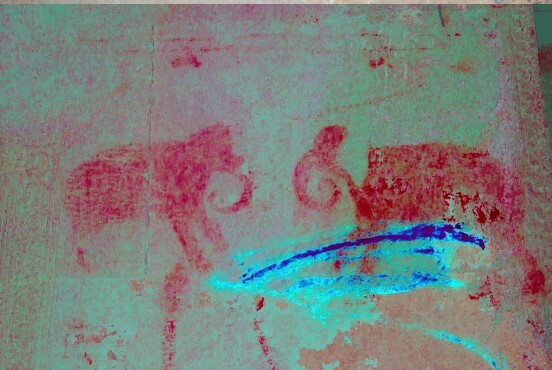 According to the researchers who uncovered it, many of the faded markings could be graffiti left behind by pilgrims after Angkor Wat was abandoned in the 15th century. However, the more elaborate paintings may be relics of the earliest attempts to restore the temple. 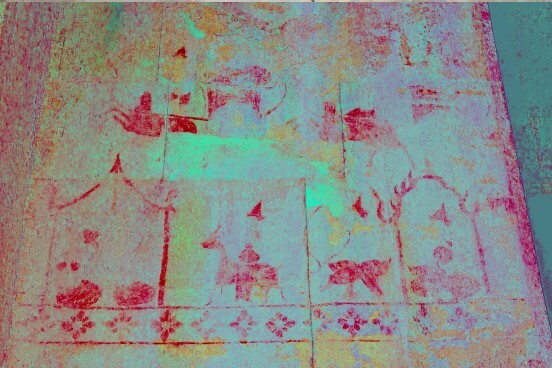 The paintings were first noticed by Noel Hidalgo Tan, a rock-art researcher of the Australian National University in Canberra, while he was working on an excavation at Angkor Wat in 2010. After first spotting the red and black pigment on the walls of the monument, he decided to investigate further. After scientists took pictures using an intense flash, they then used a tool from NASA to digitally enhance the colors of the images. To make these paintings visible, Tan and his associates used a technique called Decorrelation Stretch Analysis, which exaggerates subtle color differences. This method has become a valuable tool in rock-art research, as it can help distinguish faint images from the underlying rock. It has even been used to enhance images taken of the Martian surface by NASA’s Opportunity rover when conducting surface studies and geological analysis. According to Antiquity, a quarterly archeology review, what they found was 200 depictions of ancient life. These included paintings of elephants, lions, the Hindu monkey god Hanuman, boats and buildings — perhaps even images of Angkor Wat itself. Tan went back to the site to conduct a more methodical survey in 2012 with his Cambodian colleagues from APSARA (Authority for the Protection and Management of Angkor and the Region of Siem Reap). Some of the most detailed paintings, the ones located at the top of the temple, are passed by literally thousands of visitors every day, but the most elaborate scenes are effectively invisible to the naked eye. A lot of the visible paintings on the walls have been previously discounted as graffiti, and I certainly agree with this interpretation, but there are another set of paintings discovered from this study that are so schematic and elaborate that they are likely not random graffiti, but an attempt to decorate the walls of the temple. Christophe Pottier, an archaeologist and co-director of the Greater Angkor Project who was not involved in the new study, agreed that these more complex murals show deliberate intention and can’t be interpreted as mere graffiti. Pottier, however, added that the discovery of hidden paintings isn’t all that surprising. Though they haven’t been studied systematically before now, several traces of paintings have been found at the temple during the last 15 years. And though researchers can’t be sure exactly when the paintings were created, Tan speculates that the most elaborate artworks may have been commissioned by Cambodia’s King Ang Chan, who made an effort to restore the temple during his reign between 1528 and 1566. During this time, unfinished carvings were completed and Angkor Wat began its transformation into a Buddhist pilgrimage site, which are confirmed by some of the newly revealed paintings that show Buddhist iconography. Ultimately, getting an accurate look at ancient heritage sites and representations is only one of the benefits of this new process. In addition, there is the potential for heritage conservation. With countless sites around the world being threatened by war, environmental issues, and neglect, getting a digital record of pictures like these will ensure that the works of ancient peoples to chronicle their lives and express themselves artistically will be preserved, long after the physical objects are gone. Back from Europe – Part the Last! This is so cool! It’s one of my greatest regrets that I didn’t get to see Angkor Wat during the 3 weeks I was in Cambodia. We drove past it, even! This is super awesome though, and great photos!! I know. Ancient buildings have such power, don’t they?